Skip the stress of searching for missing pieces to this classic outdoor game. The Triumph Competition Microfiber Bean Bag Set are the perfect upgrade or replacement bean bags for any bean bag toss game. 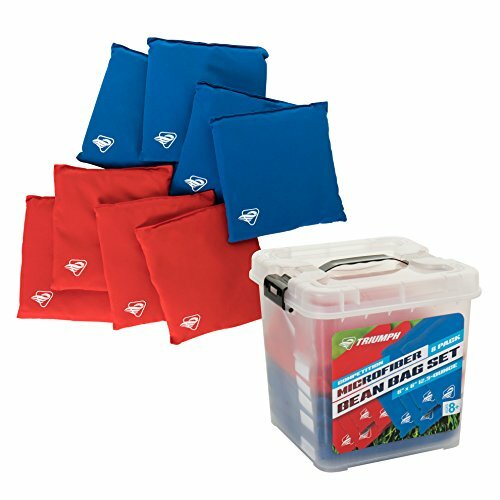 The four red and four blue microfiber bean bags weigh 12.5 ounces. The 6” square bean bags are durable, allowing you to spend more time enjoying playing with family and friends. When you're finished playing, easily transport and store both sets of bean bags in the included clear plastic storage container with two locking clasps. If you have any questions about this product by Triumph Sports, contact us by completing and submitting the form below. If you are looking for a specif part number, please include it with your message.